Comes vacuum sealed to retain freshness and softness. The bark at the tip is easily removed even without the use of a knife. Chew the bristles to separate the natural fibers to form like toothbrush bristles. To clean the teeth, brush with Miswak from the edge of the gums in a up and down movements till the cutting edge of the teeth. The miswak or siwak is a natural tool for brushing the teeth. It is taken from the roots of the Arak tree especially in the Arabian Peninsula and some parts of Asia the tree is known as Peelu. 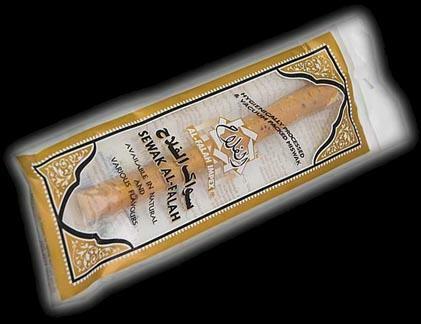 Miswak is a natural antiseptic, multi-purpose stick cleans and whitens the teeth and sweetens the breath, and is widely used throughout the Islamic world. The use of sewak is recommended by the Prophet Muhammad (pbuh). Research shows that the bark of the "Toothbrush Tree" contains on antibiotic which suppresses the growth of bacteria and the formation of plaque in the mouth. Research also suggests that the regular use of Miswak significantly reduces plaque, gingivitis, and the growth of cariogenic bacteria. No toothpaste required! Miswak, naturally contains many components such as fluoride, astringents, detergents, resins (a possible enamel protectant) and abrasives. Simply scrape off bark from the tip (1/2"), then chew the tip gently until brush like and the fiber becomes soft. Brush teeth horizontally and frequently. When the bristles are worn and the flavor has subsided, cut them off & repeat instruction. I have been completely satisfied with this product. Shipping was fast, this is the best price I found, & the Miswaks are good quality. Will most likely continue to order from this company. Shipping was super fast and a free gift was included. I am very picky about how my miswak tastes and these are the best brand out there. They don't have much taste and they dont taste funny either. Amazing miswak. jazakallah!! THIS BRAND IS THE BEST BRAND OUT OF ALL THE MISWAK COMPANIES OUT THERE!! THEY ARE THE BEST! No more fluoride toothpaste for me! Miswak is the best! Excellent, quality of product, rapid delivery.